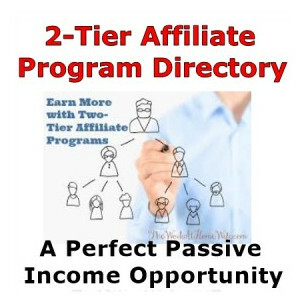 A 2 tier affiliate program is a program which rewards you for the efforts of others. When you join an affiliate program as an affiliate and then enroll others under you, those affiliates that you enroll are your second tier, in a two tier affiliate program. Now every time one of those second tier affiliates makes a commission from a sale, you get a commission from that sale too, and you didn't have to work for it. 2 tier affiliate programs attract a lot of affiliates but be aware that it is not enough to sign up a bunch of affiliates who in turn sign up their own bunch of affiliates. A product must be sold before anyone makes any money. It is important that you do some research on the product and the affiliate program before agreeing to participate. See this article on Top Paying Affiliate Programs and the Questions You should Ask About Them. If you have no desire to promote a consumer product, I suggest that you find a 2 tier program where the affiliate is the product, such as a monthly membership affiliate program. Next: What Is An Upsell? Previous: What Are Residual Income Affiliate Programs?